ISBN 1540001776. 9x12 inches. Whistler/Hummel. Your students have finished the Apollo Album of violin duets (04472690) and are ready for something more challenging. 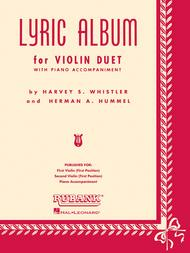 The Lyric Album of grade 3 violin duets by the masters is the perfect choice. 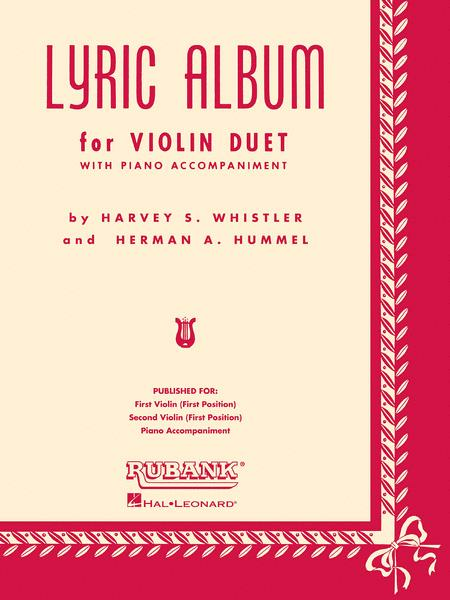 Compiled by Rubank legends Harvey Whistler and Herman Hummel, these longer arrangements provide not only more technical challenge for intermediate students, but progressively increase their musicianship as well. Includes: Andantino (Lemare) • Danse Macabre (Saint-Saens) • Gypsy Love Song (Herbert) • Menuetto from Symphony Concertante (Mozart) • My Wild Irish Rose • Swanee River (Foster) • On Wings of Song (Mendelssohn) • Prairie Lament • Rondo (Beethoven) • Scarf Dance (Chaminade) • Tambourin Dance (Rameau) • Valse de Salon (Brahms) • Young Prince and the Princess from Sheherazade (Rimsky-Korsakov) • more.